Newark Liberty International Airport (EWR) is the most straightforward airport to fly into to get to KMC New York because of the airport shuttle and because it houses a NJ Transit train station. Depending on city traffic, Newark is about a 2 hour drive to KMC NY. JFK International Airport (JFK) and LaGuardia Airport (LGA) offer many flight options into New York City at good rates, and both are easily accessible through public transit. Depending on city traffic, these airports are about a 2 hour drive to KMC NY. If you are planning on renting a car, you can also check flights into Stewart International Airport (SWF) in Newburgh, NY which is just an hour’s drive to KMC NY. The Wilkes Barre Scranton International Airport (AVP) is about a 1.5 hour drive to KMC NY. And the Bradley International Airport (BDL) in Hartford, CT is 2.5 hours drive to KMC NY. Taxi Service from Newark Airport (EWR) or Stewart Newburgh Airport (SWF): J & L Taxi Service: (845) 856-3544. $155 flat fee from EWR or $80 flat fee from SWF for up to 4 people. Taxi: Taxis are available in Port Jervis and Matamoras to KMC NY. $18-$25/car each way. 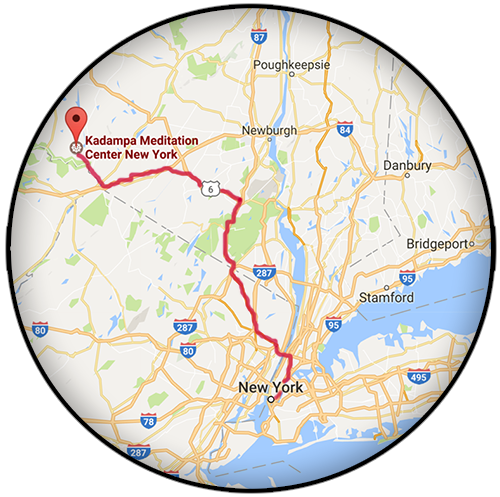 It’s just 10 miles (about a 20 minute drive) between Port Jervis and KMC NY. Take Route 97 west from Port Jervis for approximately 6 miles, through the scenic Hawk’s Nest. Crossing a small bridge, turn right onto County Road 31 (CR-31) and continue for exactly 4 miles to Sweeney Road, which is on the right side around a curve (look for the KMC NY sign on the left side of the road). If you see Pete’s Country Store and gas station, you’ve gone too far. Turn onto Sweeney Road, and KMC NY is 1/4 mile up the hill. These fees apply to help cover the costs of shuttle services. Onsite parking priority is given to those people with a Festival parking pass and a valid handicapped parking permit. If you are disabled and need a nearby parking space, please indicate this on your registration form. US drivers must have a valid Disabled Parking Permit.